Sixteen clergy members, known as the Medicaid 23, have been pardoned by Governor Jay Nixon (D) for their trespassing convictions involving a 2014 protest in the Missouri Senate. The demonstration, which called for Medicaid expansion, temporarily disrupted business that day for state senators. 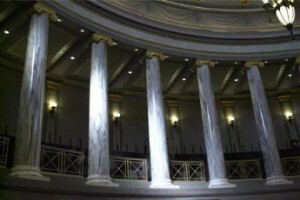 The members were arrested by Capitol police after declining to leave the chamber. In 2016, a Cole Court Circuit Court found 22 of the 23 members guilty of trespassing. Sixteen of them petitioned Nixon for clemency. Six others want their trespassing convictions to remain on their records. Republican Governor-elect Eric Greitens will be sworn into office on Monday. Due to term limits, Nixon did not seek re-election.